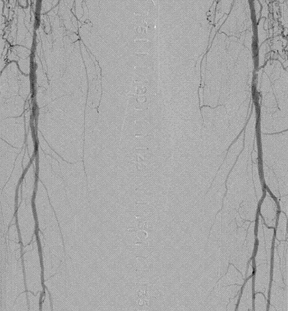 A digital subtraction angiogram showing high take-off of right anterior tibial artery, making it prone to iatrogenic injury along with popliteal artery during TKA. Arterial injuries are twice common during total knee replacement than during total hip replacement.1 The most commonly affected arteries are popliteal artery and common femoral artery respectively. Literature search shows the incidence of popliteal artery injury to be 0.03% to 0.05%.2,3,4 However, abnormal location of arteries make them more prone to injury as happened in our case. Similarly the incidence of arterial injuries is much more in patients with peripheral vascular disease mostly related to tourniquet use. Ninomiya5 et al has shown that use of posterior retractors during TKA make popliteal artery more prone to injury. Similarly hyper-flexion and hyperextension of the knee joint during TKA causes kinking of the popliteal artery with possible injury to it especially in the presence of atherosclerosis. In our case, because of the high take-off of the anterior tibial artery (Figure 1), one of the above factors may have contributed to the arterial injury. To prevent arterial injuries, thorough preoperative assessment with emphasis on peripheral vascular system can identify at-risk patients. Similarly, during operation, knowledge of the anatomic relationship between popliteal artery or other anomalous vessels (eg,anterior tibial artery in our case) and the tibial plateau can reduce the incidence of arterial injury during orthopedic surgery. Calligaro KD, Dougherty MJ, Ryan S, Booth RE. Acute arterial complications associated with total hip and knee arthroplasty. J Vasc Surg. 2003;38(6):1170-1177. Erratum in: J Vasc Surg. 2004 Mar;39(3):628. Comments in: J Vasc Surg. 2004;39(6):1361-1362, J Vasc Surg. 2004;39(5):1148; author reply 1148. Calligaro KD, DeLaurentis DA, Booth RE, et al. Acute arterial thrombosis associated with total knee arthroplasty. J Vasc Surg. 1994;20(6):927-930; discussion 930-932. Rand JA. Vascular complications of total knee arthroplasty. Report of three cases. J Arthroplasty. 1987;2(2):89-93. DeLaurentis DA, Levitsky KA, Booth RE, el al. Arterial and ischemic aspects of total knee arthroplasty. Am J Surg. 1992;164:237-240. Ninomiya JT, Dean JC, Goldberg VM. Injury to the popliteal artery and its anatomic location in total knee arthroplasty. J Arthroplasty. 1999;14(7):803-809. Arterial injury to an anomalous anterior tibial artery during total knee arthroplasty. Appl Radiol.